A firewall is a piece of computer equipment with hardware and/or software that sorts the incoming or outgoing network packets (coming to or from a local network) and only lets through those matching certain predefined conditions. A firewall is a filtering network gateway and is only effective on packets that must go through it. Therefore, it can only be effective when going through the firewall is the only route for these packets. The lack of a standard configuration (and the “process, not product” motto) explains the lack of a turn-key solution. 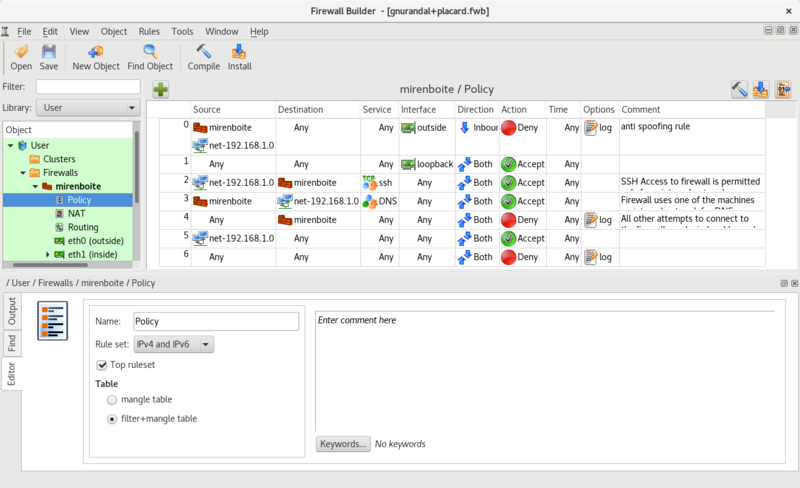 There are, however, tools that make it simpler to configure the netfilter firewall, with a graphical representation of the filtering rules. fwbuilder is undoubtedly among the best of them. A firewall can be restricted to one particular machine (as opposed to a complete network), in which case its role is to filter or limit access to some services, or possibly to prevent outgoing connections by rogue software that a user could, willingly or not, have installed. The Linux kernel embeds the netfilter firewall. It can be controlled from user space with the iptables and ip6tables commands. The difference between these two commands is that the former acts on the IPv4 network, whereas the latter acts on IPv6. Since both network protocol stacks will probably be around for many years, both tools will need to be used in parallel. Each table contains lists of rules called chains. The firewall uses standard chains to handle packets based on predefined circumstances. The administrator can create other chains, which will only be used when referred to by one of the standard chains (either directly or indirectly). FORWARD: concerns packets transiting through the firewall (which is neither their source nor their destination). ICMP (Internet Control Message Protocol) is the protocol used to transmit complementary information on communications. It allows testing network connectivity with the ping command (which sends an ICMP echo request message, which the recipient is meant to answer with an ICMP echo reply message). It signals a firewall rejecting a packet, indicates an overflow in a receive buffer, proposes a better route for the next packets in the connection, and so on. This protocol is defined by several RFC documents; the initial RFC777 and RFC792 were soon completed and extended. For reference, a receive buffer is a small memory zone storing data between the time it arrives from the network and the time the kernel handles it. If this zone is full, new data cannot be received, and ICMP signals the problem, so that the emitter can slow down its transfer rate (which should ideally reach an equilibrium after some time). Note that although an IPv4 network can work without ICMP, ICMPv6 is strictly required for an IPv6 network, since it combines several functions that were, in the IPv4 world, spread across ICMPv4, IGMP (Internet Group Membership Protocol) and ARP (Address Resolution Protocol). ICMPv6 is defined in RFC4443. REDIRECT (only in the nat table): redirect a packet to a given port of the firewall itself; this can be used to set up a transparent web proxy that works with no configuration on the client side, since the client thinks it connects to the recipient whereas the communications actually go through the proxy. Other actions, particularly those concerning the mangle table, are outside the scope of this text. The iptables(8) and ip6tables(8) have a comprehensive list. The iptables and ip6tables commands allow manipulating tables, chains and rules. Their -t table option indicates which table to operate on (by default, filter). The -N chain option creates a new chain. The -X chain deletes an empty and unused chain. The -A chain rule adds a rule at the end of the given chain. The -I chain rule_num rule option inserts a rule before the rule number rule_num. The -D chain rule_num (or -D chain rule) option deletes a rule in a chain; the first syntax identifies the rule to be deleted by its number, while the latter identifies it by its contents. The -F chain option flushes a chain (deletes all its rules); if no chain is mentioned, all the rules in the table are deleted. The -L chain option lists the rules in the chain. Finally, the -P chain action option defines the default action, or “policy”, for a given chain; note that only standard chains can have such a policy. The -p protocol condition matches the protocol field of the IP packet. The most common values are tcp, udp, icmp, and icmpv6. Prefixing the condition with an exclamation mark negates the condition, which then becomes a match for “any packets with a different protocol than the specified one”. This negation mechanism is not specific to the -p option and it can be applied to all other conditions too. There are more specific conditions, depending on the generic conditions described above. For instance, the -p tcp condition can be complemented with conditions on the TCP ports, with clauses such as --source-port port and --destination-port port. The --state state condition matches the state of a packet in a connection (this requires the ipt_conntrack kernel module, for connection tracking). 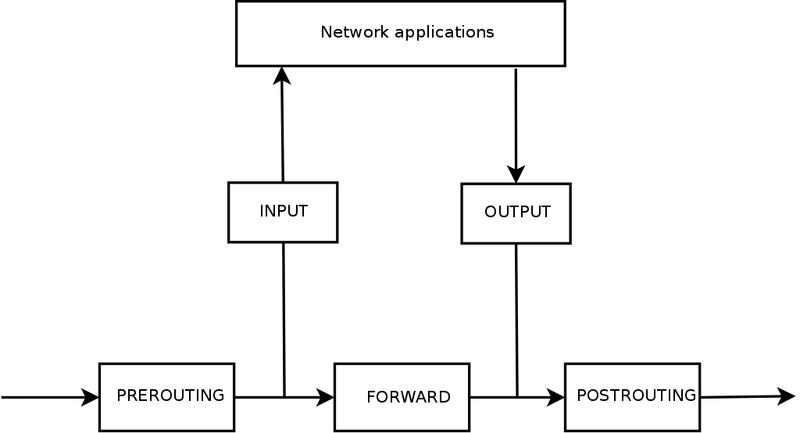 The NEW state describes a packet starting a new connection; ESTABLISHED matches packets belonging to an already existing connection, and RELATED matches packets initiating a new connection related to an existing one (which is useful for the ftp-data connections in the “active” mode of the FTP protocol). --log-tcp-sequence, --log-tcp-options and --log-ip-options indicate extra data to be integrated into the message: respectively, the TCP sequence number, TCP options, and IP options. The DNAT action provides the --to-destination address:port option to indicate the new destination IP address and/or port. Similarly, SNAT provides --to-source address:port to indicate the new source IP address and/or port. The REDIRECT action (only available if NAT is available) provides the --to-ports port(s) option to indicate the port, or port range, where the packets should be redirected. Each rule creation requires one invocation of iptables/ip6tables. Typing these commands manually can be tedious, so the calls are usually stored in a script so that the same configuration is set up automatically every time the machine boots. This script can be written by hand, but it can also be interesting to prepare it with a high-level tool such as fwbuilder. the ports belonging to the services hosted on the servers. The rules are then created with simple drag-and-drop actions on the objects. A few contextual menus can change the condition (negating it, for instance). Then the action needs to be chosen and configured. As far as IPv6 is concerned, one can either create two distinct rulesets for IPv4 and IPv6, or create only one and let fwbuilder translate the rules according to the addresses assigned to the objects. fwbuilder can then generate a script configuring the firewall according to the rules that have been defined. Its modular architecture gives it the ability to generate scripts targeting different systems (iptables for Linux, ipf for FreeBSD and pf for OpenBSD). In other cases, the recommended way is to register the configuration script in an up directive of the /etc/network/interfaces file. In the following example, the script is stored under /usr/local/etc/arrakis.fw. This obviously assumes that you are using ifupdown to configure the network interfaces. If you are using something else (like NetworkManager or systemd-networkd), then refer to their respective documentation to find out ways to execute a script after the interface has been brought up.